PartCycle.com makes it easy for you to get the quality used parts you need for your vehicle, fast. Using your VIN number can help identify more information about your vehicle so you can ensure you're ordering the right part. 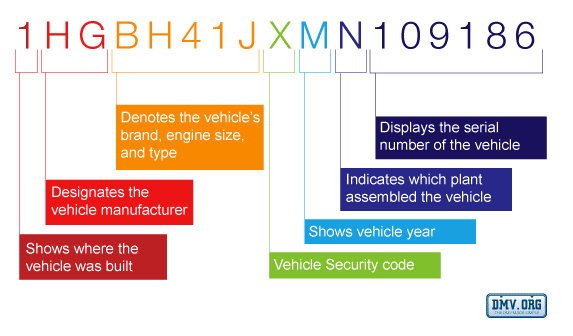 The vehicle identification number (VIN) is the identifying code for a specific, individual automobile. Each VIN number is unique and serves as the car's "fingerprint", as no two vehicles in operation have the same VIN number. A VIN number is the string of 17 numbers and letters that an automobile manufacturer assigns to an individual vehicle, at the time it is manufactured. What Can a VIN Number Tell Me? The VIN reveals certain things about a vehicle including engine size, model year and trim level. Knowing these details can help you identify the exact configuration of your vehicle, so when searching for parts on PartCycle.com, you can ensure you're getting the right part at the right fit. Click on the below image to see the image close-up. Note: VIN locations may vary per vehicle, but should be located in at least one of the below. Inside the driver-side doorjamb—Open the door, and look underneath where the side-view mirror would be located if the door was shut. Rear wheel well—Try looking up, directly above the tire. Driver-side doorpost—Open the door, and look near the spot where the door latches, not too far from the seatbelt return. Lower-left corner of the dashboard, in front of the steering wheel—You can read the number by looking through the windshield. Front of the engine block—This should be easy to spot by popping open the hood, and looking at the front of the engine. Front of the car frame—near the container that holds windshield washer fluid. If you still can't locate the VIN, call a dealership or the manufacturer and request guidance. The 10th digit of a vehicle’s VIN represents the vehicle’s model year. By identifying the model year of a vehicle, you can help ensure you're ordering the correct parts for your vehicle, and avoid repair delays.